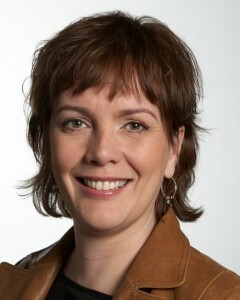 Svandis Svavarsdottir has served the coalition government of Iceland for almost two years. Her Left-Green Party is part of the ruling coalition that was voted into power following the failures of Iceland’s major banks and consequent public anger at the corruption and poor governance at the root of those failures. Prior to taking this position, Svandis served for three years in the Reykjavik City Council during a period of much debate on energy policy for the municipally-owned Reykjavik Electric Company. She was one of only two Left-Green party members on the 15-member council. The Left-Green Party holds five of 10 national government ministries and 15 of 63 Members of Parliament. In addition to the Ministry of the Environment it has the Ministries of Finance, Education Science & Culture, Internal Affairs (aka Justice & Human Affairs), and Agriculture & Fisheries. The Prime Minister is from the Social Democratic Party, which holds the remaining ministries. I met with the minister in her office in Reykjavik for approximately 50 minutes on the afternoon of March 3, 2011. She was a few minutes late because she had been called to parliament to cast a vote. She had walked the several city blocks from the parliament building to the ministry office and greeted me and her reception staff warmly upon arriving through the public entrance. It crossed my mind that she could have easily bumped into friends on her walk from parliament, or could have run into a supermarket to pick up the makings for that evening’s dinner. Before we began the formal interview I let the minister know that many greens in the US and in Massachusetts are inspired by the rise of the Icelandic Left-Green Party. Svandis’ party is one of other examples around the world including Caroline Lucas’ Green Party seat in the UK Parliament, Adam Bandt in Australia, Eva Joly’s upcoming Green Party presidential campaign in France, and Antanas Mockus’ presidential campaign advancing to the final round last year in Colombia. Iceland’s Left-Green Party offers a model for greens around the world to look to for strategy and ideas. Scott Laugenour: I find it interesting that your party, formed in 1999, represents itself with a hyphenated name. The Massachusetts affiliate of the Green Party of the US also hyphenates its name. The Green-Rainbow Party in Massachusetts was formed in 2002 when a social justice movement (the Rainbow Coalition Party) and a green movement (The Massachusetts Green Party) merged. It seems that both my party and yours have this identify in common. Svandis Svavarsdottir: This identity is very important to me and for my party. The main focus on being a left party is social equality and rights. The ‘Left’ in our name refers to our belief in social equality and justice. These are the battles and arguments that are being waged now. The market doesn’t recognize equality, which must be achieved through our social and legal systems. The ‘Green’ component adds the ‘time element’ or the future element into the vision of our party. One doesn’t only consider the here and now, but we look at the social equality between people born now and those born 50 years later. The notion of sustainable development is a natural and logical next step from the vision of social equality. SL:How have your two years in the ministry been so far? What are your priorities, accomplishments, and challenges? SS: Well, it has been a challenge to work in the ministry after the economic crisis. Everything was a mess. The main issues that the government was dealing with was the economy and coming out of the banking crisis. But at the same time you have the urge and the need to change the values of the nation. Everything had gone wrong in the first decade of this century. People in Iceland began to believe that making money was the way to be happy. That was not only in domestic policy-making, but also in society as a whole. We had a right-wing government for 18 years and no one interrupted them when they privatized parts of the education, health care systems, and the telephone system. They were always coming up with what they thought were ‘good ideas.’ The crisis was, therefore, not only economic but an identify crisis of the nation. It’s not simple for a politician to step into this vacuum. Usually, politicians deal with only practical things – to solve the problems of here and now. But we have to address much broader and more philosophical questions regarding more or less all of the most popular priorities before the crash. We are now talking a lot about building a ‘new Iceland’ but in many ways I think before we can do that we have to rediscover ‘old Iceland.’ Because the generations before us were people who used things over and over again, didn’t buy new furnishings until they had mended and re-mended them. In the last years we just started throwing things away. Society was very consumerist. Because we are a small population these changes in value and vision happened very fast. SL:Does that make you optimistic? That the smaller population makes it easier to change? SS: It makes me optimistic in the way that it is POSSIBLE to change. It’s easier to change the direction of a small car than of a big ship. That can make you optimistic. But then there is always the dilemma of what you believe and what you do in this tug-of-war. It’s easy to have visions and thoughts. You talk about priorities about how important it is to recycle, but then you go ahead and get a paper cup of coffee instead of drinking from a ceramic mug. SS: This important value of just being honest – a good person – a good member of society – good to your neighbor, good to your soul mate and so on. It’s important to see the society not only as an economic machine. Something beyond what can be measured by the GDP. GDP is not enough. We need different measurements. SL:What are some examples of high-priority legislation that you are pushing through the parliament now? SS: There are several pieces of legislation that I would like to mention, 1) legislation directly from the European Economic Area, which is a Water Protection Bill. It’s very important, but until recently Icelanders have not recognized the importance. We think our water is plentiful and clean and doesn’t need protection, but this is important legislation for us. 2) Iceland’s entry into the Aarrhus Convention, from the United Nations Economic Commission for Europe. It establishes the rights of individuals and of groups to influence decisions in the environmental field. It opens up how the general public can influence legislation. 3) I’m also working on a general review of the Nature Preservation legislation. It’s a very big project. I’ve been working on that for two years and I think I will have the whole bill completed and passed in the fall. SL:Is environmental protection considered a ‘soft’ issue now? SS: I’m glad you asked me this. At the moment I am probably the most criticized minister in the government. That’s because I put question marks where people want to build new aluminum smelters, they want to transition fast to geothermal energy, they want to go fast to find easy jobs and easy money. I’m the one who says we have to wait. We have to do research and proceed in a sustainable manner. Of course we must understand the impatience of unemployed people; unemployment is something we are not used to in Iceland. It’s a very serious economic and social problem. Because of the unemployment and need for work it is often special challenge to be a green minister. Your opponents try to make you look as impediment to investments and therefore to work. SL:So you are not allowing it to be a ‘soft’ issue. SL:What ministries do you work most closely with? SS: I work most closely with the ministry of Industry & Tourism. That’s because all land use permits for energy plants are handled in my office. Many things must be done in our offices before energy plants can be built, for example. With tourism, many visitors come to Iceland because of nature and the environment, so we work closely with the ministry for that reason, too. There are individual projects, though, with nearly every ministry that we work closely on. SL:What is the state of hydrogen research in Iceland? Are there green energy opportunities there? I see that there are hydrogen cells powering some of the public buses here. SS: That issue isn’t in focus as much as it should be now. We are doing all kinds of research on moving beyond petrol to a more sustainable methods. We have an incentive program for people to convert conventional cars to methane. Of course we’re very supportive of researching all possible sources of new energy. SL:Why can’t I recycle glass and aluminum in Reykjavik at my neighborhood recycling center? SS: Unfortunately at the moment glass and aluminum are recycled at only two or three recycling centers. The city council of Reykjavik is now changing this to make it easier for people to recycle closer to their homes. Iceland is in the process of appointing a group of twenty-five citizens who are not in government to draft a new constitution for the country. Iceland, upon obtaining independence from Denmark, adapted the Danish constitution but never went through the complete process of writing one. Following the banking collapse, the government proposed that a citizens’ council be formed in order to draft a new constitution for the country. SL:What hopes do you have for the new Constitution that is planned? Are you familiar with the new constitution in Ecuador that has given constitutional rights to the environment and natural eco-systems? SS: What happened in Ecuador sounds very interesting. Here, the discussion on the ownership of natural resources is a central issue for me with the new constitution. At the moment it is not clear who owns the fish in Icelandic fishing zone within 200 nautical miles, or the water, the geothermal hot water, etc. The other thing is the right of the general public to information and to a healthy environment. The current constitution has strong language on the freedoms of the job market and on property rights. But the rights of the general public are very weak. SL:Corporate influence in government is well past a critical point in the US. It’s a power shift that has been extreme. Our courts have declared that corporations have constitutional rights and they have a lot of money. Is such a power shift a threat in Iceland? What are some green strategies that counteract that? SS: I wish I were speaking Icelandic now! This is a very central issue in my politics, in defining my role because of my view on democracy. Where does my power as a minister or a member of parliament come from? Democracy is designed so that power comes from the vote – for a party or for a man or woman. When I or my party gets a vote, it’s a torch from the people. We in the parliament carry it into the government. In my view it is very important that this ‘torch’ that we get from the people be the same ‘torch’ that our party takes into government. This has shifted in Iceland from different powers in society with great interests, like the energy markets. If we in government are not careful, one day you discover as you sit at your desk that the fire of the torch has diminished or even died and your job resolves around making deals with other powers. That is something so very wrong and so very far away from democracy. Because then, the voting day is a kind of theater; it’s not about giving people power. I have heard that in Norway they make studies analyzing the flow of power in society. Where does it go? For both people sitting in local councils or parliaments, it’s very important to understand where the power comes from. It’s not only those groups with different interests that can diminish the torch; it’s also power we have from above or abroad such as the European Union or from international decisions, like human rights decisions, and so on. It comes from somewhere else, not the voters. In the same way you can diminish the power of the voters by privatization. An example: if the voters vote for me to take care of their schools and their radio and their telephone system and their hospitals, but I decide to sell the hospital because it’s my political opinion, I have taken away from the voter part of his or her vote. This is because next time the voters are not voting on this hospital. The power of the vote is shrinking through privatization. It is diminishing democracy. SL:Many people in Iceland, when they protested the previous government and demanded change, felt very empowered when the previous government resigned. Many Icelanders I speak to seem to understand that their actions helped to bring about change. We in the US are trying to energize the population in ways that they have that knowledge of their power. SS: We here in Iceland are in a different situation in the US because even though we haven’t had many major changes in government from year to year, we are few and we know that we don’t need many millions of people to make huge change. We have a broader political spectrum here. SL:What lessons are there for the Left-Green Party in the recent elections in Ireland, where the Green Party is no longer in power. SS: We can learn from many examples, of course. We are still a young party, formed in 1999, and have been rooted in opposition. That has been our character. Of criticizing. Of pointing out the faults and what is wrong. It hasn’t been one of coalition and compromise. We’re just learning from our own case. When I step a bit back and look at the field and look at myself ‘down there’ in parliament, I see the party going through difficult situations because we need to compromise. However we’re here for doing real change. If you want to turn the page you have to have 51% of the votes. SL:This leads to my next question. What is the picture you paint to voters in Iceland about what the country will look like when you achieve 51%? What would be different if you were in power and not in a coalition? SS: What I think is a central issue and endlessly important is to change the way we look at our well-being. GDP is not enough. I’ve been looking at the GPI, General Progress Indicator, which combines economic, social, and environmental measures. That would of course only be the first step as the society would see radical changes. Social justice and equality is a central issue but also gender equality, the welfare system, sustainability in all aspects also. SL:Where did this GPI measure come from? SS: It was developed in your country, my friend! First developed in the US, more countries are beginning to use it to look at the broad picture. That’s very important, I think, because if you look only at the usual indicators you make a very unhealthy society, as we did in the first decade of this century. Also, it helps us see how we deal with our resources. We have to understand and act – managing the fish, geothermal energy, and waterfalls, for example – in a sustainable way. That might change our way of living. That does not mean that we become less happy. It’s a question of values. SL:Are you seeing examples of progress towards that now? SS: Yes, we are trying to work ourselves to more social equality, changing the tax system so that it is more fair. Lower income people now pay less than before the crisis, while those who have higher income, they pay more. It’s a difficult change in the market. The important things: the view on the resources, measuring the progress, and education. How we educate our people towards the very demanding questions of this century. SL:What advice do you have for other greens who are organizing? SS: Focus on young people. Politics is where we usually present an aura of pessimism. ‘The world is going under, it’s the end.’ The key is that green politics are the politics of optimism that are realistic. It’s the only way. It’s the way of surviving. If we go that way we can get through the century. This is how you bring the torch over to the young generation. If you go the way of capitalism or the old ways, then we’re just walking to the end. This is the message that should be taken to young people, on campuses and schools. Take it everywhere! SL:Does the Left-Green Party have active chapters in schools and universities that include young people? SS: Yes, we had very strong young groups in the beginning. The challenge of a party like us is that we come from the grass roots. Suddenly you are in the government. Then there’s a danger that we tear ourselves apart and lose the connection. We have to remind ourselves why we go to work, who do we work for? What is my mission? For people, for nature, for the future. The chapters in the colleges are now working together with the Social Democrats, so it’s less clear now. I always say that we should focus on the young people. In addition to young people you should think of feminism – about women in parliament and women as a political force. That aspect of equality is important globally. It’s the way of change. Change comes through women. They are the ones raising the next generations of children. This is a key part of successful green politics.